RDG agrees. This was a good first step, but more needs to be done to enhance XBRL quality. Since the inception of the XBRL mandate, the SEC has been very deliberate (all too deliberate) in the gradual implementation of the requirement, and they continue to move slowly toward stricter enforcement of the necessary standards of XBRL quality. They are, however, moving in the right direction. There will always be companies that wait for the SEC to take discernible enforcement actions before complying with certain regulations. But for those companies that want to remain in compliance and ahead of the SEC’s future enforcement—and that want to supply XBRL data that is useful to analysts and investors—there are some simple and cost effective solutions. If you’re using an outsource provider for XBRL tagging that outsources the tagging or uses automated software to create quick-and-dirty XBRL, your code is sure to have a large number of errors and may not fly under the radar of the SEC’s XBRL RoboCop. RDG Filings is among the top five most active filing agents in the country, we are proud to have set the standards for both customer service and XBRL data quality, and we are thrilled to be able to offer this quality at significant savings over the other reputable providers. High quality XBRL data is not cost prohibitive. Contact us for a quote. 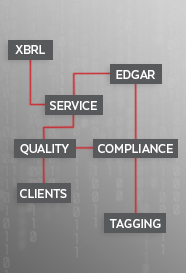 If you are using in-house software to create your own XBRL, and if you want a higher degree of confidence that your code is properly built, RDG’s XBRL Quality Assurance Department provides you with an independent, 3rd party review of your XBRL code, and our QA team of expert CPAs will ensure that your XBRL is not simply SEC Compliant, but that it satisfies the most up-to-date and strictest recommendations from the FASB, the AICPA, and the XBRL.US. Contact us for more information. At this point, it is undeniable that the XBRL mandate is far from perfect. However, it is important to maintain perspective and to understand the SEC for what it is. It’s a large government bureaucracy that moves slowly but steadily. It may be plodding along, but the SEC is moving toward increased enforcement of XBRL quality. It is up to companies to be sure they are out in front of the SEC. RDG Filings can help.